We are slowing down our search for the perfect 'cottage.' We started to realize how many options are available, and we don't want to invest before we know exactly what we want. Except its hard to know what we want, since we have very little experience cottaging. So I am reaching out to you, in the hope that you can share some of your experience with us!!! We are also tired of renovating. We don't want to worry about maintenance and renovations on a second property. We want to arrive, put our trunks on, and relax. Luxury and maintenance free? This does exist in Muskoka...there are fractional ownerships galore, as well as a few subdivision style cottage communities, or we can rent, or visit resort type lodges. So this is where we need you! Please share with us, what are you looking for in a cottage? how do you spend your time while you are at the cottage? At what age do kids get bored of the cottage? What do your kids love about the cottage (or what did you love about the cottage when you were growing up)? How often do you get away? 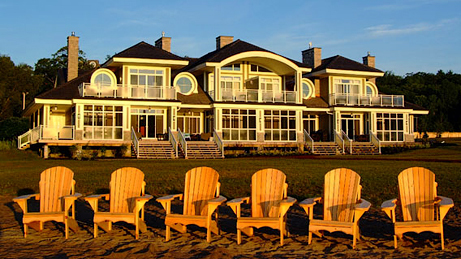 Have you ever considered a fractional ownership? I was going to put up a poll, but I really want to ask these open ended questions and hear from you!!! Maybe you can also tell me what you think about the above villa/fractional ownership (purely based on one picture, a picture that's worth a thousand words!) Thanks in advance for sharing!!!!!!! *I probably sound a bit spoiled and you are right, I TOTALLY am! We want a place we can share with friends and family, and really relax and enjoy ourselves for at least one week, maybe two every summer... and I want that place to be beautiful! And close to the beach....We aren't likely to go every weekend because we have so much going on in the city...the occasional thanksgiving dinner hosted up north, or a New Years spent skating on a frozen lake would be nice too! I'm right there with you! As great as a rustic, no electricity, simple lifestyle sounds, there are some things I can't life with (bugs) or without (hot showers). I hope you guys find the perfect place for your family! At the cottage, we like tinkering and puttering around on cottage projects, eating, entertaining, reading, swimming, fishing and just plain lounging around. All at a very slow pace, and usually with a drink in one hand. Our 9 month old daughter loves being in the lake (we hold her while she splashes around and laughs uncontrollably), and so far she likes boat rides. We hope it will last forever, but something tells me, she will not like hanging out with her family, once she becomes a teenager. I've noticed cottagers usually fall into 2 camps: Those that seek quiet relaxation and those that seek excitement. So i'm not sure how the fractional ownership thing plays out when you've got the 2 different types cottaging so close together. In cottage country neighbours tend to interact WAY more than in the city, so getting along with your neighbours is pretty important. We spend about 3 hours each day on the dock (lounging, reading, sunning, fishing, swimming, etc), so a dock would not be something i'd want to share. Well we always rented cottages. My parents preferred that we travel to other places during the year as well instead of just having a cottage. I would say that we never outgrew the cottage. We brought boyfriends up there eventually. I liked the rustic but clean, very clean but if it was my own I would want somewhere I wasn't afraid to mess up, where we would keep our shoes on inside but where there was luxury thrown in like with great mattresses, couches and a nice kitchen. I hate the idea of a tv at a cottage and have so many wonderful memories of playing games and cards. we've been throwing around the idea of buying one, but prefer to put all our eggs into the main house at this point. What really kills me about cottages is the DRIVE (2 hours each way, sometimes) and lack of internet. I know that you're supposed to get away from it all, but really, we didn't even know about Oslo tragedy until getting back to the city. So one little window into the real world would be nice. I like the idea of getting a place in a community that provides kids friendly entertainment. Especially once they are older. I wouldn't look for a place that is in the middle of nowhere. I think I would aim on the luxury side myself, dingy things will just piss me off and prevent relaxation. Partial ownership would be awesome, I think... not sure though. everything seems to have its drawbacks eventually. Hey guys, I went over to disqus like all the cool kids...I hope I did it right! Hopefully, my old comments import over soonish! I am totally like you! I love all the convenience and lifestyle of the City but also the tranquility and difference from a cottage. The ongoing upkeep and commute doesn't seem to justify for ownership if we are only using it a couple of weeks in a year IMO. We then rent or go to friends' and family's cottage instead these days. On the downside, it's not your own and you can't really decorate and furnish it the way you want it. We've had a cottage in our family for 40 years now, and I've grown up with it... I've NEVER gotten tired of it. It's my happy place. =) It's nothing special in terms appearance -lots of orange '70s decor, but we all love that about it. It means you don't have to worry about anything getting damaged. We don't have a tv, but we do have the Ottawa river to play in, kayaks, games... for me, that's what a cottage is all about: making memories with family. I've been spoiled throughout my childhood as I had a bit of the luxurious cottage exposure, as well as the rustic version. Both my dad and my moms parents have their own place that we visit frequently. My dads parents is fancy, more of a summer house with all the bell and whistles while my moms parents place has the rustic edgy feel. They're both amazing for obvious reasons. I really don't think you can go wrong any way you decide! I feel like as a young teen I much preferred the fancy cottage, because my attention span was much shorter and having internet was OBVIOUSLY a must (I shake my head at my 16 year old self), but now that I'm older I much prefer the cottage in the middle of absolutely nowhere with the hammock right beside the lake and a fridge filled with cold beers. I can safely say that while during my teen years I was adament about having a friend up at either cottage with me, I never once got sick of going. Ours is a combo - we have a working kitchen, bathroom, laundry and satellite tv. :-) But we also have bugs (not in the cottage too often) and a billion things on the 'to do' list every year. Trees fall, weeds grow, bears do damage in the winter (sometimes). I grew up into my teens with a "cottage" cottage: rickety, mildewy, buggy and pretty terrific. I loved it. The cottage we visit now belongs to my in-laws and is more of a house-on-a-lake than a true cottage. It has its benefits - laundry and air conditioning and a fully stocked kitchen among them - but I miss the days of the rustic, true cottage. I like cooking everything on the grill, and saving room in the fridge for worms. I was never bored, and my kids rarely are either. They love swimming and kayaking and canoeing and tubing, and boat rides to the marina, and fishing, and reading on the dock ... they're just as happy with a day spent on the water as a day spent in the hammock reading books, or hunting for salamanders. Because the cottage isn't ours, though, we don't have to worry about maintenance and taxes and bills and whatnot. I'm not sure I would want the headache right now, especially while we're juggling jobs and kids who are still relatively young. Have you considered renting? Someone else mentioned it in another comment, and I think it's a fine plan. Many owners are very open to developing long-term relationships with renters: if fact, plenty of them are actively seeking them. Committing to a property is huge, but you can "rent around" for a few years to figure out which lake and/or area you like best, before you negotiate an annual commitment. Many are willing to rent for a month or more at a time so if you found a cottage you loved, it might be worthwhile to romance the landlord and sign on for a few years in advance. Just a thought!